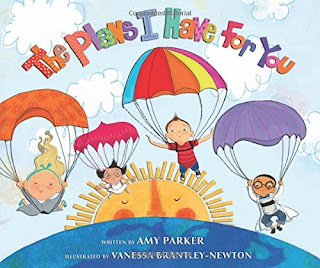 During our Sunday morning devotional time, after some raucous worship in the basement, the boys and I sat down to read The Plans I Have For You by Amy Parker and illustrated by Vanessa Brantley-Newton. The title seems to come from Jeremiah 29:11, in which God promises a future and a hope and has plans to prosper and not to harm the the Jews exiled in Babylon. It's an oft quoted verse among Christians, perhaps so much so that the authors didn't feel the need to mention the scripture anywhere. Instead, the book is written in the voice of God, speaking both to readers and to the cute, multicultural children depicted in the lively illustrations. A visual metaphor of the "You Factory" runs through the pages, as God creates children destined to be firefighters, chefs, nurses, mountain climbers and ballerinas. I appreciate the message of this book, which encourages children to not only dream about their futures, but to rest in the thought that God has formed them with a specific talents and gifts to accomplish a specific task on the earth. I was pleasantly surprised that all three littles (ages 7, 4 and 2) stayed tuned in for the entire book (albeit for different reasons). My oldest enjoyed answering my husband's questions about the metaphors in the book: "Steve, why do you think they're parachuting? Where do the plans come from? Where are the kids going?" The final prompt on the last page, which urges children to drop the book and get out and find that special, just-for-them plan, caused him to immediately pray, "God? What is your plan for me?" My younger boys insisted on "reading" the book again themselves, delighting in the children on conveyor belts and parachuting out of the sky.